I always thought a great ongoing series is like an old friend. Every few weeks it comes to stay, brings some beers, and then leaves with the promise of some much nicer beer the next time he rolls into town. 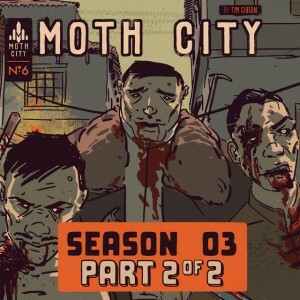 Moth City always feels a bit different. It walks into your house with a fine brew, lets you enjoy it, and just before you finish punches you square in the gut. But man does it feel good. The emotional punch comes midway through the issue, when Governor McCaw makes an ultimately reprehensible choice. This choice, while evil and would damn any normal person to hell, feels earned and in character. Too often do the main cast in issue make a choice that feels underdeveloped and out of character, but Gibson maintains a strong grasp of his cast as he moves forward. Also, who would have thought that the most noble and human of his cast would be the first one infected? Jun continues to battle his inner demons, as well as all the outside ones. This leads to some fairly exciting and tense moments as the remaining uninfected battle both sides of the coin. One thing that ultimately seems missing is more emphasis on his feral side, but with a large event looming at the end of the issue, it seems like things can only get worse. As usual, Gibson’s art duties are stellar. His panel design is fantastic, and while the first half of the issue is light on the motion panels, that is easily forgiven when the aforementioned scene takes place and Gibson really shows the potential of this format. Really the only thing that can be said otherwise is that a lot of this issue feels like it is setting up for the big finale, and while that won’t be a bad thing in the long run the tease begins to drag. That said, when this issue gets rolling, it really gets rolling. 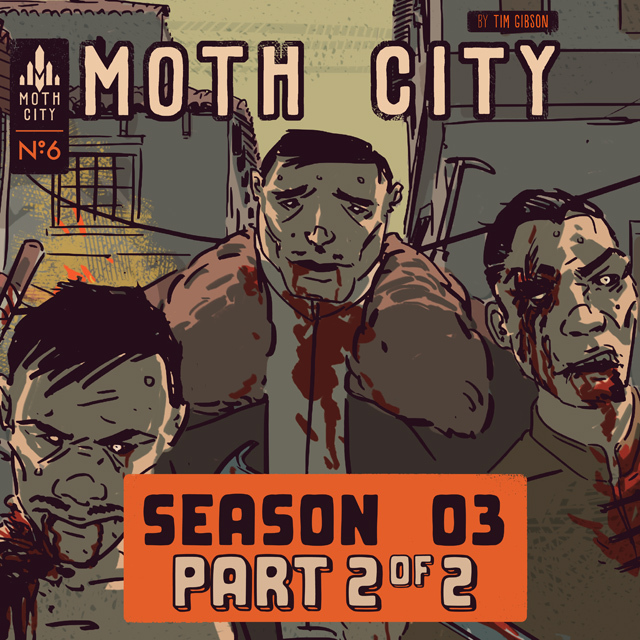 Moth City only has two more issues left before the end, and Tim Gibson has kindly posted the first issue on Comixology for free, so really at this point, you have no excuse.